On Friday August 24th Kenz Cranes, well-known specialist in offshore cranes and lifting equipment, successfully delivered the new build 400t boom hoist offshore pedestal crane. After been fully tested and commissioned the crane has been transported from the Kenz construction quay in Zaandam to Amsterdam, where the crane has been installed onboard Seajacks’ jack-up vessel ‘Leviathan’. Last Friday the new Kenz crane has been transported to Shipdock Amsterdam, where the installation of the crane took place. 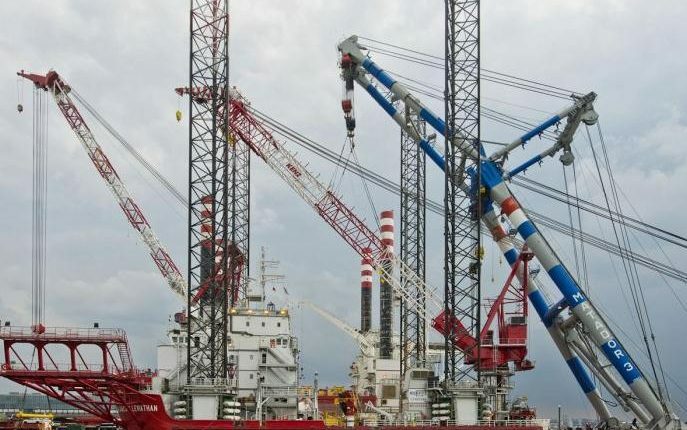 The crane has been transported in one piece by the ‘Matador 3’, the biggest floating sheerleg in the Netherlands. The 400t pedestal crane with a 78m outreach is custom-designed for the installation of offshore wind turbines, and will replace a 300t main crane and 100t auxiliary crane. Due to special adjustments, the crane is also suitable for shallow waters subsea operations in the oil & gas industry. Also the under deck vessel strengthening and electrical vessel modifications will be executed under the supervision of Kenz Cranes. Due to the successful operation and good performance, Kenz Cranes has been awarded with a repeat project for the new build Seajacks jack-up vessel ‘Hydra’. This crane is scheduled to be delivered in the second quarter of next year.